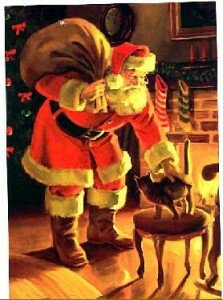 There a lot of tacky Christmas items (ice cube trays etc) but here is a home decoration worth looking. Click on the link below to take a look. It is a detailed and comprehensive look into the vanished world of Edwardian fashion, an era defined by rigid social stratification, which revealed itself in the clothing worn by those with social status and those without. She re-creates a world using both words and illustrations — many in color — when travel was only for the wealthy and the middle class. Those in third class or steerage were the poor, making their way to the New World and, they hoped, a better life. Also, it was a time when dressing for travel was more than climbing into a pair of gray gym sweats and strapping on a backpack. I have to admit, I have not given any deep thoughts to Edwardian fashions (except what I have read in various Titanic books and histories of the period). It was a totally different era of travel. Men of stature and substance were expected to wear good clothes no matter what they did. Many of their clothes would be tailored while men and women who were professionals of one kind or another wore ready-to-wear clothing. Those of lower classes wore functional clothing but did not appear shabby either if they could avoid it. As a kid I remember that when we flew (which was a major thing back in those days), most people tried to look good. Men wore slacks or at least casual pants and nice shirt. Women wore nice outfits. In short, you tried to look spiffy. Those days are long gone as well like the Edwardians. Then again my parents came from a generation where looking right was stressed even in the worst of times (and they both grew up during the Great Depression). Some places try to make it upscale by requiring customers to come properly dressed. Many years ago an uncle accompanied us to a fancy place for dinner which required men be attired in business formal (suit, tie, shirt and slacks), women in dresses and children properly attired as well (my mother got a curt reminder that I had to have my coat on when I got up to get something from a buffet table at this place). My uncle had nice slacks and a turtleneck. It was winter so we did not think it would be an issue. It was but fortunately the maitre’d simply handed him a tie to wear around his turtle neck. It looked ridiculous but those strict rules of fashion came from that period. The meal, however, was delicious so it was worth all the hassle of getting dressed up. And back then a gentleman going to evening dinner outside his home was expected to look his best (women too as well). Gone too are the rich meals of the Edwardian era though some of it came back some decades later with restaurants that served high end French food. Few of them are around today (there is one in New York that Tony Bourdain went to his No Reservations show) and have menus with foods unheard of by modern chefs today. I guess that is part of why Titanic is enduring. It offers much and never quite disappears like other disasters. And I guess fashion is just another facet of Titanic and the era she lived in. Readers here will recall that in the wake of Hurricane Sandy, Clive Palmer decided to put the gala dinner for Titanic II in early December on hold. Now the gala is set for 26 Feb 2013 in New York. Invitations for the same high power guest list are being sent out. Palmer will unveil the Titanic replica plans at the dinner. Correction: In both this post and a previous one, I referenced the Simpson letter. However while RR Auction lists this as part of the December auction, the letter was bought earlier this year by Titanic Foundation and brought to Belfast for exhibition. In fact, it was exhibited during the summer. In short, I got it wrong. I kick myself for not checking my own news archive about this. At the recent RR Auction the top bid for Titanic iceberg photo was $21,000. Not all items were sold and a third auction is being considered next April. So far, there is no report that the Simpson letter was sold. 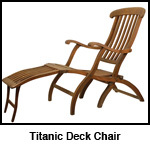 According to Digital Journal, a Titanic deck chair was auctioned off for $59,000. The auction was held by RR Auctions in Nashua, New Hampshire on 16 Dec. The name of the winning bidder was not disclosed. At time of writing, no word on other items auctioned (Titanic iceberg photo, Simpson letter). 1. BBC News is reporting two men originally from Holyhead, who served on Titanic, are being honored with a plaque in in Marine Square. Hugh Roberts perished and his body was recovered by CS Mackay-Bennett. He was given a funeral at sea. Edward Brown, who worked as a first class steward, survived. He helped load lifeboats and was washed overboard by a wave as Titanic sank. Clinging to a lifebelt, he was rescued by a collapsible lifeboat. Itv.com has a video of the ceremony. 2. If you are going to be near Ballymena, Northern Ireland during the holidays, there is a Titanic exhibit you can check out. The Mid-Antrium Museum at The Braid is showing two Titanic exhibitions until 5 January 2013. Titanic Honour & Glory and Titanic: A Photographic Exhibition are both there. Best of all there is no fee into the museum. Remember you are welcome to comment on news posted here. 1. Express & Star (UK) is reporting a new memorial stone for Titanic cellist John Wesley Woodward, who perished when Titanic went down in 1912, has been put up in his honor. Wesley was from West Bromwich and his memorial stone had stood in Heath Lane Cemetery for decades. However the sandstone memorial had become weathered with age and two Black Country residents feared it would crumble, so they began seeking funds to replace it. Donations from local groups helped raise £900 to replace the stone. A ceremony was recently held to mark its unveiling. 2. Douglas Main, writing for OurAmazingPlanet.com, recently wrote of his experience visiting Titanic:The Artifact Exhibition at Franklin Institute in Philadelphia. One of the features he liked was that you got to know some prominent passengers. He was also surprised to learn the large number of second and third class passengers coming to America for a better life. 3. Robert Ballard believes he has found evidence that the Biblical story of a global flood may have some basis in fact. He has found an ancient shoreline 400 feet below the surface of the Black Sea. Pottery, man-made structures, and possibly an ancient shipwreck with human bones inside. His theory is that Earth was covered in ice 12,000 years ago and that when it started melting floods occurred. Carbon dating of shells from the shoreline indicates the Black Sea flood, which he calls the mother of all floods since that land stayed under water, was around 5,000BC.